← Charter Schools part 1: Opportunity or Obstacle? But, of course, we already knew the answer: Coney Island Avenue had been paved by a low-bid contractor, working under the oversight of private engineering consultants. They, in turn, had been supervised by civil servants who may have lacked the tools to impose useful sanctions if either the consultant or the contractor screwed up. Could efficiency improvements — which Mayor Bloomberg’s 2010 charter revision commission may try to implement — solve this? The answer, unfortunately, is “not easily.” To draw a “bright line” in the public contracting process and eliminate the possibility that discretionary contract award decisions could enable corruption to creep in, the city and state use processes that ultimately seek to award a major construction contract to the lowest qualified bidder through an open bid competition. On the surface, this seems to make sense. But when you look at it more closely, it gets sticky. To enable the receipt of competitive bids, the city, through its Department of Design & Construction, has to design or specify a construction job in so much detail, so clearly, and so unambiguously, that all prospective bidders receive the same comprehensive description of what they’re supposed to build. 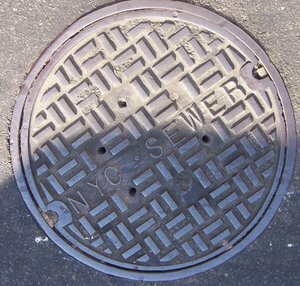 For a street resurfacing job, they’ll probably need to know the map, the exact area, what materials they’re allowed to use, how thick the new surface has to be, what condition the substrate is in, how much of a “crown” they can give the road to ensure proper drainage, what leveling tolerances the city will demand at manhole covers, how much curb height will need to be preserved, how many lanes can be closed, what kind of safety signals will be required, what hours they’ll be permitted to work, etc., etc., etc. This means someone has to write the equivalent of a “detailed bid specification.” If a job is too complex or too large for one of the city’s engineers or architects to do this, DDC will first need to use a “consulting firm” to develop the design specs. It engages the consulting firm through a competitive “request for proposals” (RFP) process. (The State process is slightly different at this step, and is, perhaps, even more onerous.) The RFP process alone can take many months, and requires prospective consultants to commit substantial resources for an uncertain outcome. Once the consultant is engaged, and does the design specifications, bids can be solicited for construction. We’re just scratching the (roadway) surface here. We won’t take you through all the detailed steps involved to initiate a project, secure funding, and then, at numerous points during the process, obtain oversight agency approvals. But the important conclusion we want you to reach is that government’s difficulty getting things built is not from employee incompetence; it’s from the endless stream of safeguards built into the contracting process to prevent public funds from being diverted by corruption or favoritism. When those safeguards are eliminated or weakened in an effort to increase efficiency, as they are when the Department of Education, for example, issues a large “no-bid” contract for consulting services, not everyone is happy. The prognosis for taxpayers is not good: Either pay extra for the cost of all the procedural safeguards (and the municipal employees who implement them) built into public contracting, or pay extra for inflated contract prices and the kickbacks that dishonest public officials can extort when bids are awarded without open competition. This entry was posted in 2010 NYC Charter Revision, Government 101 and tagged 2010 charter revision, DDC, Department of Design & Construction, Mayor Bloomberg, municipal contracting, New York City government, New York potholes, NY bad streets, NY government bids, NY potholes, NYC bad streets, NYC contracts, NYC potholes. Bookmark the permalink. Your readers might be interested in the link below that discusses a comprehensive system of measuring street smoothness as a tool for scheduling repairs. Alas, it was not embraced by the powers that be.